What ended up on Governor Kasich's desk was a bill that represented input from all interested parties, from boat owners to the Ohio Environmental Council, from the aforementioned departments to the Ohio Farm Bureau. The educational initiatives and requirements in S.B. 150 will go a long way toward making our agricultural community even more knowledgeable about best practices in the use of fertilizer. Also this year, a $10 million program called the Healthy Lake Erie Initiative provides, for the first time ever, state funds through the capital budget to support initiatives that will improve the environmental and economic health of the Lake Erie region. Working with the Lake Erie Charter Boat Association, the Toledo-Lucas County Port Authority and the Ohio Environmental Council, this new capital fund is viewed as part of a series of long-term strategies to help clean up the lake. The chain between factory farms and contaminated drinking water is a long one. It starts with confined animal feeding operations (CAFOs), where animals are kept in close quarters in order to maximize production. This generates a huge volume of waste, which is stored in massive lagoons like the one seen above. That waste isn’t treated, however, and when those lagoons overflow or contaminate groundwater, the result is a release of waste filled with a variety of potentially infectious organisms — and nutrients that algae and plants love to feed on. This causes a phenomenon known as nutrient pollution (another culprit for nutrient pollution is fertilizer runoff from industrial agriculture), where waterways become choked by organisms that are growing out of control because they’re getting far more nutritional support than they usually do. They can out-compete native species and totally change aquatic environments. And they can cause drinking water contamination, which leads to large-scale no-drink orders like the one that just happened in Toledo. "A lot of the lakes are turning green this year where they didn't last year," said Gerry Maciej, Benton Soil and Water Conservation District manager. In June, a dog's death after swimming in Prairie Lake near Clear Lake prompted warnings about blue-green algae. 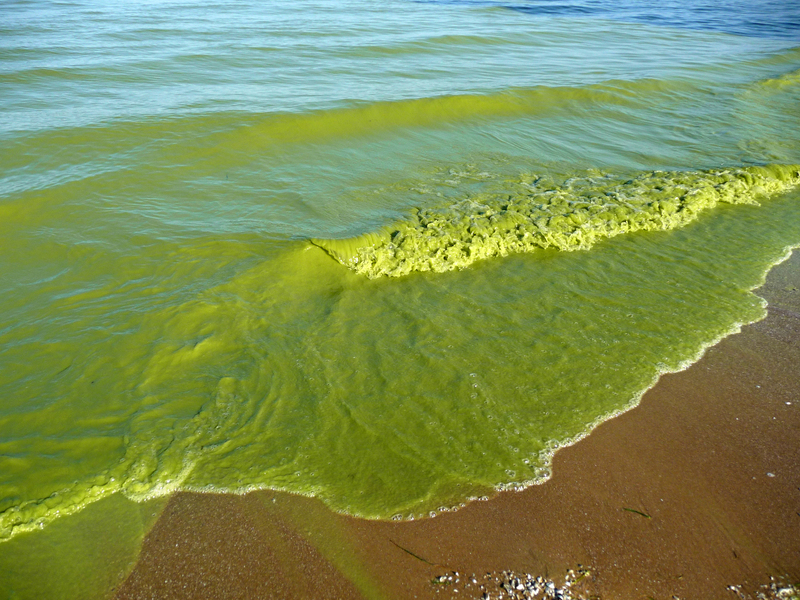 Blue-green algae has been reported in Lake Winnipeg and Dauphin Lake in Manitoba, prompting advisories from conservation authorities. Officials say the algae levels are above the recreational water quality guideline but the toxins are below them. According to health experts, ingesting water containing blue-green algae can be fatal to some animals and can cause serious illness in humans. In the atmosphere, the volcanic gases mixed with water to form acid rain, which decimated forests and left the soil with no roots to keep it in place. Intensified weathering then washed this soil, along with extra nutrients, into the ocean. The additional nutrients in the water encouraged the growth of algae, which increased the amount of organic matter that sank into the ocean depths. The decay process of this organic matter consumed oxygen, and depleted the oxygen faster than it could be replenished. Although algae grow prodigiously and contain potentially useful molecules — especially lipids, which can be turned into high-energy fuel and other products — extracting those molecules has proved complicated and expensive. So far, virtually the only marketable products based on algae have been high-end skin creams. But a Nevada company, Algae Systems, has a pilot plant in Alabama that, it says, can turn a profit making diesel fuel from algae by simultaneously performing three other tasks: making clean water from municipal sewage (which it uses to fertilize the algae), using the carbon-heavy residue as fertilizer and generating valuable credits for advanced biofuels. If it works, the company says, the process will remove more carbon from the atmosphere than is added when the fuel is burned.